Following on from our most recent blog post about Kids Club Kampala’s School Sponsorship programme which you can read here, I wanted to share with you my personal experiences of sponsoring a child. Sponsoring a child to go to school is an issue which is very close to my heart as for the last 5 years I have sponsored a child myself. I first met Beth in 2007 when I was living in Uganda, and she was working as a maid for a family I knew. She was 8 years old. We became good friends and I started to help her out around the house so she could spend time just playing and being a child, and also I started to help her learn some English. During the end of my first time in Uganda, after I had been there 6 months, Beth managed to tell me in broken English that she was going back to her village. I thought it was really unfair that this young girl of only 8 years old had been working as a maid and then was being sent back to a village where she would struggle to get enough food and didn’t have any chance of getting an education. I didn’t know what I could do to help, so I asked her and she told me that the thing she really wanted to do was to go to school. So the next day I went with her and enrolled her at the local primary school and paid her school fees for her. 6 years on, Beth is now 14 years old and has just finished Year 5, where she is doing really well. 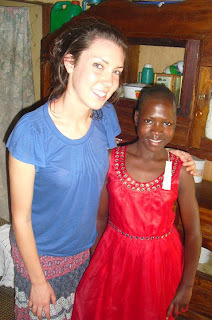 I regularly visit her when I am in Uganda, and it is amazing to see the huge difference I am making in her life. Helping Beth to go to school is definitely one of the best things I have ever done and I would really recommend it to anyone. Kids Club Kampala currently has 18 children (including Beth) being sponsored to go to school through Child Sponsors from the UK. Without a Sponsor, these children would not have the opportunity to attend school, receive a good education and grow up having hope for a bright future. If you would like to know any more about Kids Club Kampala’s School Sponsorship programme or about my experiences as a Child Sponsor, please feel free to email me olivia@kidsclubkampala.org – would love to hear from you!